165 - 15 is an important tyre size of the 60’s. All sorts of top cars fitted them Morgan plus 4, TR5, TR6, Lancia Flavia Austin Healey, MGA, TVR Tuscan, Volvo P1800 and early Porsche 911 and 912. 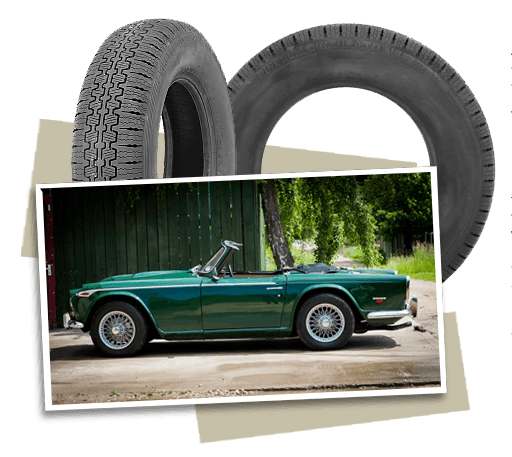 At the same time 165 HR 15 PIRELLI CINTURATO ™ tyres are an ideal radial alternative to the tyre size 560X15, and so would be an excellent radial tire for a VW Beetle, MG TD and the Porsche 356. PIRELLI developed their first radial tyre in 1952 with this CA67 tread pattern, and it became the bench mark tyre and was used as standard equipment by many of Europes most exotic car manufacturers, such as Ferrari, Maserati, MG, Rover and Lotus. When Porsche first developed their 911 in 1963 it fitted 165 – 15 tyres. Porsche offered a variety of brands, and one of the fitment options at the time was this 165 HR 15 PIRELLI CINTURATO ™ CA67. In this period cars such as the Porsche 356 when fitting a radial tyre instead of 560-15 crossply tyres would have fitted the 165 HR 15 CINTURATO ™ CA67 as it was the leading sports car radial tyre.